The International Maritime Dangerous Goods (IMDG) Code or International Maritime Dangerous Goods Code is accepted as an international guideline to the safe transportation or shipment of dangerous goods or hazardous materials by water on vessel. A Corrigenda was published earlier this month that makes some changes to the 38-16 version. Note that this version becomes mandatory for use starting January 1st, 2018. The words “marking” and “markings” have all been replaced with “mark” or “marks” through the entire code. The new Class 9 Hazard Label for Lithium Batteries also received some clarification in Chapter 5.2.2.2.1.3 in that the number of vertical stripes must be 7 at the top and the bottom must have the symbol and the number 9. Words describing the hazards are not permitted on this label. Special Provision 384 that speaks to the new Class 9 Hazard Label was revised to clarify that there is no placard equivalent to this new label. If needed, the normal Class 9 placard should be used. 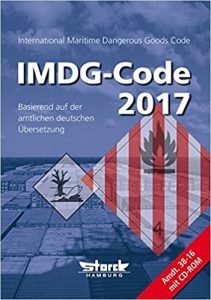 The International Maritime Dangerous Goods (IMDG) Code was adopted in 1965 as per the SOLAS (Safety for Life at Sea) Convention of 1960. The IMDG Code was formed to prevent all types of pollutions at sea. The code also ensures that the goods transported through marine transport are packaged in such a way that they can be safely transported. The dangerous goods code is a uniform code. This means that the code is applicable for all cargo-carrying ships around the world. The dangerous goods code has been created as per the recommendations of the United Nations’ panel of expert on transport of dangerous goods along with the IMO (International Maritime Organisation). This recommendation by the UN was presented as a report in the year 1956 after which the IMDG Code was started to be drafted in the year 1961.